The diamond mining giant De Beers paid for a Globe and Mail reporter to visit its Victor mine, arranged the details of her trip, and ended up with a glowing article about them in the newspaper that failed to quote any of the mine’s many critics in the community, whose protests halted the project’s expansion. The article, “Diamond mines give economic sparkle to Canada’s North,” resulted in a reader complaint to Sylvia Stead, the Globe’s public editor. Stead’s review concluded that the piece “lacked balance”. 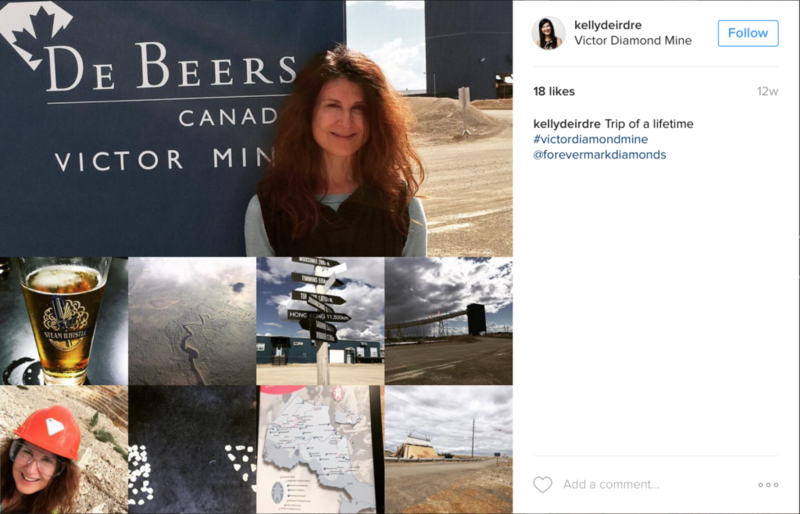 The story’s author, Deirdre Kelly, has not responded to CANADALAND’s questions about a recent picture on her Instagram account that seems to display a gift she received from Birks, a jewellery retailer who initially (but not presently) sold Victor mine diamonds. We will update this post if she answers us. The Victor mine is located not far from the troubled Attawapiskat reserve in northern Ontario. The Indigenous community and environmentalist groups have been vocal in opposition to the expansion of the mine into a nearby diamond deposit, but none were spoken to for the piece, which only quoted De Beers employees. Readers who made it to the end of the story were told the trip was arranged and paid for by a subsidiary of De Beers called Forevermark. The article was produced by the Globe’s “custom content group,” which produces editorial content specifically to accompany advertisements, it was labeled as an advertorial in a brief note at the very end of the story. Reporter Kelly is a long-time arts critic and columnist for the paper’s Style section. She was the reporter on scene when the first diamonds mined at Victor were sold to the public in 2010 at a Birks jewellers in Toronto. Kelly’s piece on the Victor mine does mention the possible downsides of the mine to the community. A study of environmental impact of diamond mining is readily dismissed by a company spokesman, with no further analysis by the reporter. A study by the Canadian Parks and Wilderness Society’s Wildlands League, released last December, claims that Victor poses a threat to aquatic life by contributing to the creation of methylmercury, a neurotoxin that accumulates in fish and other food sources of the people who live in the area. De Beers denies the allegations. Over the past 10 years it has had five universities and research groups visit the mine and carry out studies into water, peatland rehabilitation and caribou migration and management. “We sample 300 water bodies a year,” [De Beers Canada spokesman Tom Ormsby] says. Yet it seems Kelly had months of time to obtain an additional viewpoint. “There are always concerns with large-scale developments, especially in pristine areas,” said Kim Poole, a Nelson, B.C.-based wildlife biologist who works as an independent contractor. Kelly also has a previous reporting relationship with the Birks PR manager, Guindon. She’s been to his house. In 2014, she went to the home of Guindon and his partner Hugo Thibault to profile their living room for her “My Favourite Room” column. Questions to Guindon about whether the Birks box posted about by Kelly was a gift, and what it contained received no reply. But, if we hear back we’ll update our story. Kelly’s editor on the piece Stanleigh declined to answer further questions from CANADALAND. He said, “The blog from our public editor is my on-the-record take on this situation.” A further request asking whether he was aware of the Birks box and if he had any comment received no reply.